Computer users usually empty Recycle Bin in order to clean system junk files and improve performance. Often users are not aware of that deleted files might include some important data. Some likes using Shift + Delete when deleting files, which deletes files directly without move files to Recycle Bin. It is too late when you realize that some files are deleted by mistake. Thus, attentions should be paid while deleting files. Good news is that deleted file recovery is no longer a complex job, which is quite easy to learn. What should you do when important files get deleted by accident? You should know that files that are deleted from Recycle Bin or deleted by keys Shift + Delete are not totally erased from computer. It is the file information (also called entry or pointer) that is deleted, so that operating system can’t access them and new files can be stored. Hard drive sectors taken by deleted files are marked as Free and deleted file recover is possible before these sectors are obtained by other files. 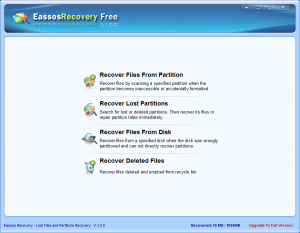 Deleted file recovery with Eassos Recovery Free. Deleted files recovery can be successfully performed as long as deleted files are not overwritten. Facing such problem, you’ll the help of deleted file recovery software –Eassos Recovery Free which can locate sectors taken by deleted files quickly and accurately, after which deleted files can be listed in the program with original directory structure. Since it is very difficult to recover deleted files completely once lost files are partly overwritten, data recovery software shouldn’t be downloaded or installed to the partition which held deleted files. Eassos Recovery Free is free deleted file recovery software and it can recover deleted Word, Excel, PowerPoint, picture, music, movie, database, and more in Windows 2000, XP, 2003,Vista, Windows7, 8. This entry was posted in Data Recovery and tagged deleted file recovery software by EASSOS. Bookmark the permalink.